Often times when I get a commission I tend to freeze up. It’s a lot of pressure to paint a commission and it can give you “painter’s block” if you don’t mitigate those feelings. Why is it so much more difficult to paint a picture for someone else than for yourself? For one thing it is hard enough to “get it right” when you’re painting from your own vision, but it’s very difficult to paint what’s in someone else’s head. How do you know if this is what they had in mind? Can I use my painter’s intuition or do they want it to be “just so”? Questions like these and more can float around your head and block the creative flow. Well, last weekend I heard a suggestion that may change the way you think about commissions forever. I was taking Alex Fong’s watercolour workshop, The Magic of Watercolour, and he was talking about commissions. He said that his trick to take the pressure off is to paint three different versions of the commission and then give the client a choice. 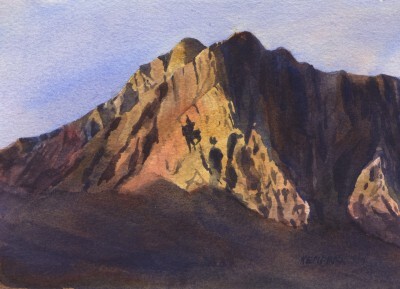 “Paint three?” you may be asking, “isn’t a commission hard enough work in the first place, let alone tackling it three times?” Yes, a commission is hard work, but part of the hard work is the struggle with the mental block of painting a commission. Imagine how much easier the paint would flow if you could lift that block and paint without any of the associated pressures of painting a commission. It would be freeing. Painting three paintings can take longer than painting one, but I have always found that in painting multiple pictures I tend to improve as I go. You will start to see shapes better. You will loosen up and carry your brush with a lighter touch using bold confident strokes. Here is a chance to learn and grow as an artist. Your client will be impressed that you have provided them with three choices. Plus, as Alex says, it alleviates that awkward pause while you’re wondering “do they like it? Gosh, what if they don’t like it?” when the client first sees your finished piece. This way they have a choice, they can pick their favourite. It actually takes the pressure off the client as well who may be asking themselves “Will I like it?”, “What if I don’t like it?”, “What will I say?”. I have tried this approach a few times before and it has worked great. 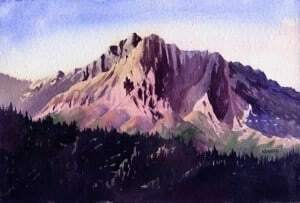 My clients have been thrilled and once I even sold two pieces instead of one! Here is my latest commission which I actually painted four times. Which one do you think she will choose? First I wet the entire paper and did a wet-in-wet wash (the brush is full of wet paint which flows into the wet surface of the pre-wetted paper) using cobalt blue, raw sienna and permanent rose. 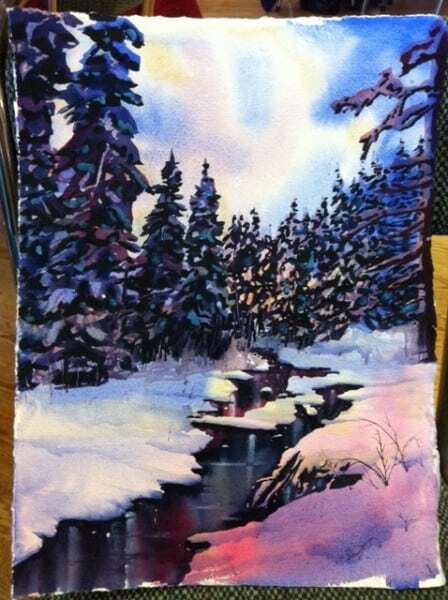 I was careful not to cover the entire surface of the paper with colour so that the wash would incorporate some white sweeps (simply the wet paper). 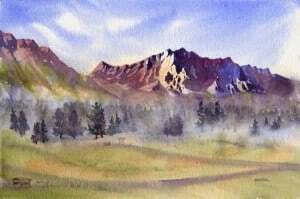 I was also careful not to use too many brush strokes which would have blended the colours together not only dulling them but creating a flat wash. I wanted the paper to sing with light and colour. 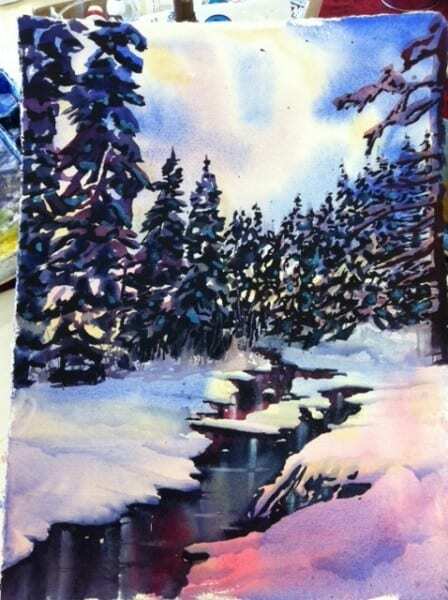 Next I waited for the paper to completely dry and then I painted in a soft layer of misty tree shapes in the background on the right, seemingly the ones which are going to be behind the stream as it curves off to the left of the viewer. What I’m actually painting isn’t the trees themselves, I’m painting what will become the shadowed snow on the tree branches, so I’m careful to paint softly and leave some light areas. In the spot where the sun is going to be catching the branches I use raw sienna rather than the cobalt blue / permanent rose mixture and I leave some white areas. Notice how I didn’t paint the trees right to the bottom branches; I used rounded shapes to give the impression that the trees are sitting behind snowbanks. To add drama I now begin to paint the darker shades on the trees using loose flowing brush strokes with purposeful yet random ‘holes’ to represent the snow on the trees. I have prepped several colours and I alternate which puddles I dip into as I paint so that the trees will have some life to them and not be one flat shape. Some of the colours I have prepared are cobalt blue, permanent rose, dioxazine purple, hunter’s green and indigo. The colours sit next to each other on my palette and they tend to run into each other too so it creates some nice shades and nuances. Another artist asked me how I paint such exact shapes. Actually I am not painting each individual shape. I am using a photograph for reference but in the process of trying to capture the essence of the snow on the trees I am also moving my brush in a rather helter skelter way so that my painting will still look like a painting. I’ve decided that I’d like to paint a tall leafless tree on the right side of the painting for balance. I want it to look like it has snow on it so it’s important that I establish the shapes before I paint in the dark shadows on the background trees. Since this scene is backlit I paint in the snow which will go on my new tree using combinations of cobalt blue and permanent rose. When it’s dry I add the branches under the snow and I continue painting the dark sweeps onto the background trees, careful to paint around the branches on my mid-ground tree. The water is a lot easier than it looks but it may take a bit of practice. I very lightly drew in my stream with pencil so that I would have an idea of where the water was to go. I don’t always draw first but with this process I am going to need to be quick so there will be no time to hesitate part way through. Once I start painting the water I must stay within the area of my stream. I did not wet the paper first. I used a lot of paint and made sure that it stayed nice and wet as I worked from the top of the stream to the bottom. Since the stream is broken up by a bar of snow I treated the top and bottom as two different sections. I didn’t want the top part to dry while I was working on the bottom part or vice versa. In order for the reflections to work out I needed the paint to still be wet. So as soon as the top shape was completely filled in I immediately dripped in some verticle swipes of very dark indigo. 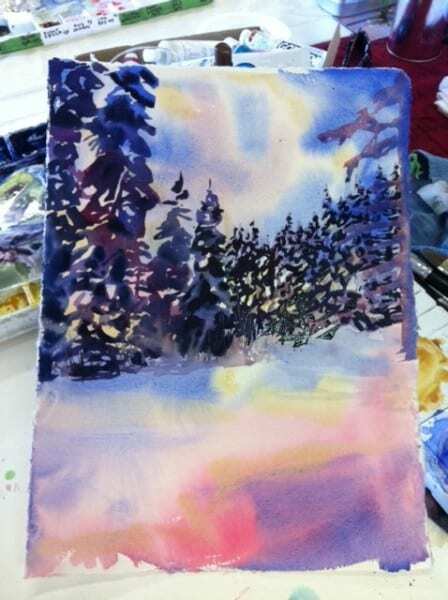 Then I mixed some white acrylic paint with a tiny bit of water and dropped in a few delicate vertical stripes. Perhaps the most important part of this is that once I laid in these colours I did not touch it any further. I let the paint do it’s thing. The bottom section of the stream I painted a little differently than the top, only because it was bigger and I was afraid it might dry before I could get to the vertical stripes which create the illusion of reflections. Switching from one colour to the next I filled the stream shape with overlapping vertical stripes which were wet enough to blend seamlessly together yet not too wet that they lose the vertical feeling. I worked quickly and then again while the stream was still quite damp I brushed in some vertical stripes of watered down acrylic paint. Not too watered down mind you because then it would have backwashed into the paint and caused some blossoms. To remind the paint that I wanted it to stay in this vertical pattern I tilted my paper up so that the paint would run vertically and not pool sideways. 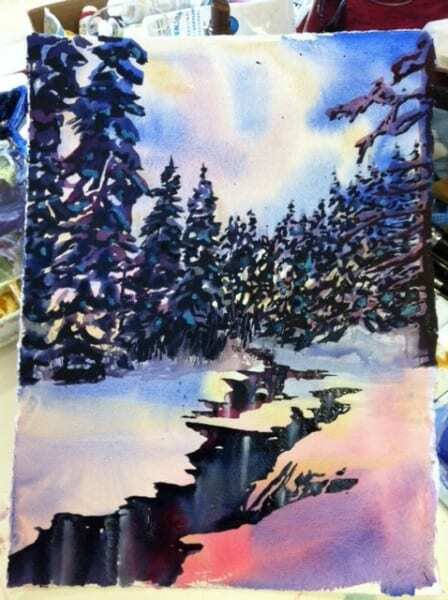 Finally I added some deep indigo just under each snowbank while the paint was still slightly damp. This let it bleed just a bit and it visually lifts the snow off the water just a teeny bit. The water now has beautiful reflections but this will sometimes unwittingly draw the viewer’s eye right off the bottom of the page. Where does the water stop? Let’s create the illusion of the stream’s surface which will immediately give the water incredible depth and at the same time keep the viewer’s eye well within your painting. For this step to work your water has to be dry or very near dry. Using a slightly damp or nearly dry clean brush, ‘draw’ a few horizontal lines across the surface of your water. Gently dab the line with a paper towel if it didn’t lift on it’s own. By lift I mean that the pigment lifted off the paper leaving a pale white line. Be careful not to over-do this step. It is so much fun and so effective that you might get carried away and if you have too many lines it can be distracting and actually take away from the overall illusion. Just a few will do. Once I finished the darks on the trees I realised that they were quite overwhelming and a bit dead, void of light. To liven them up I dropped some Holbein Grey Blue into the bits which were still damp. Holbein Grey Blue is a chalky blue opaque watercolour so it can stand up against the rich darks. This was not a planned step in my painting but I love what it did for it. In the above picture the water is believable but the snow appears to be flat as if covering a concrete surface. In nature snow is undulating and poofy; it has form. The magic happens when you add shadows to the snow. 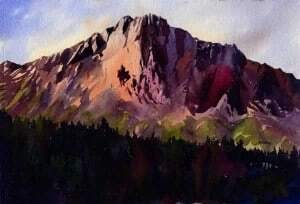 Using a lost and found line paint the top surface of a snow pile and then with clean water bleed out the top edge so that the shadow has gradation. A shadowed edge along the side of the stream virtually lifts the snow above the water and creates snow banks. 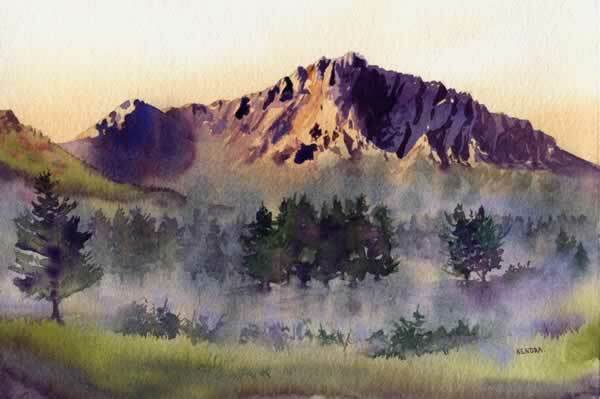 A successful painting will have an area of focus and draw your eye around the painting. You can sometimes pick out problem areas or distractions by squinting at your painting. Squint at the above picture and what sticks out to you the most? For me it is the bright snow on the branches of the trees on the left. This creates two problems: one, those trees should actually be in shadow, they are too bright which betrays the direction of light, and two, they are distracting the viewer’s attention away from the main focus which is the light shining down on the stream. Using a soft wash of cobalt blue and permanent rose I can gently eliminate this distraction and direct the eye to the area of most light (which in hindsight I wish I had put more to the right and not so close to the centre of the painting, but that’s another topic). When this painting was at the above stage I was unsure if I should call it done. I really felt like it would be fun to add some lightly falling snow, but at the same time I was afraid to ‘wreck it’. When you’ve come this far it is a little scary to start dripping paint over your painting. 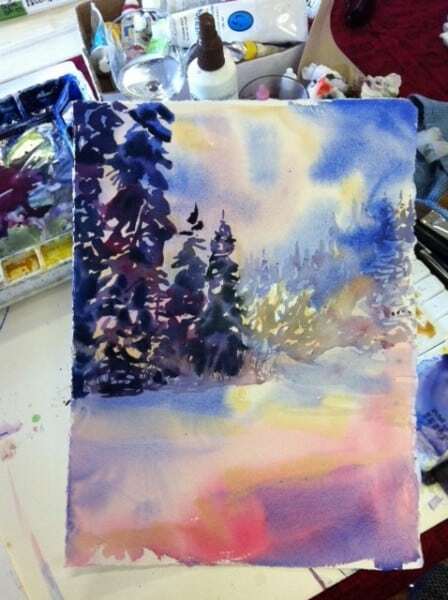 Luckily for me I was taking a watercolour workshop and I asked my classmates if I should add snow or not. The response was 50-50, half said snow, half said no. So to break the tie I deferred to the expert, our workshop instructor Alex Fong. His response delighted me. He said “Of course! Everything needs a little snow. Just Go For It!” I’m sure glad I did since the snow really lightened up the dark areas without distracting from the focus and gave life and movement to the painting. If you feel that your painting needs a little extra something, have fun and just go for it! When you are brave enough to “wreck it” you can sometimes luck out and get beautiful results. 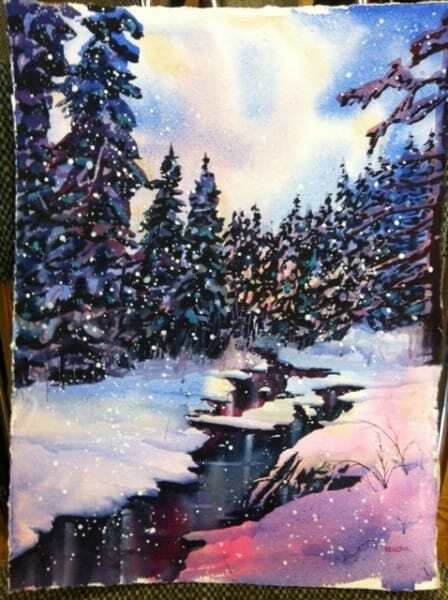 I had a lot of fun painting this winter water scene. I hope you enjoyed seeing the steps I took to create it. Please reply below if you have any comments or questions. Thank you!